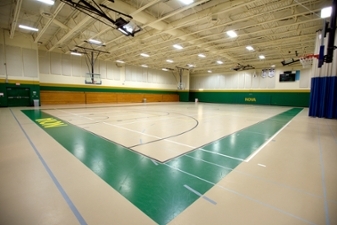 The Ernst Community Gymnasium can host games, tournaments, athletic contests, craft shows, cooking and computer shows. Bleachers are located on the left side of the gym and seat up to 250 people. If a stage is needed in the gymnasium, we can provide you with (16) 4' x 8' stage sections with heights of 8" x 16" x 24" x 32". The gymnasium is only available for rent Friday after 2 p.m. through Sunday until 11:30 p.m. Some exceptions can be made to this policy if you book your event six months in advance. * Ernst Community Cultural Center will not provide chairs. Food and/or beverages are not allowed in the Gymnasium. If you are planning to serve refreshments at your event, you must reserve the Atrium or Forum.